Walking distance 3.25 km On rocky and shingle shore. 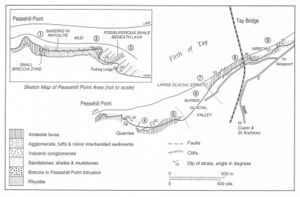 Purpose To examine a sequence of volcanic rocks, together with minor amounts of sediments, belonging to the Ochil Volcanic Formation of the Arbuthnott Group of Lower Old Red Sandstone age, exposed on the southern shore of the Tay Estuary at the Tay Railway Bridge. The igneous rocks consist of a rhyolite body and associated breccia; a number of lava flows, mainly andesites, agglomerate and tuffs. Among the sediments are a thick volcanic conglomerate, tuffaceous sandstone, sandstones, mudstones, a debris flow and a fossiliferous shale. The succession is about 240 m thick, lavas accounting for approximately 150 m.
Route The outward route from St Andrews is along the A91, crossing the late-glacial raised beach, to Guardbridge, thence by A919 through Leuchars to A92 as far as the fork at 438233. Thereafter follow an unclassified road north-west across the fluvioglacial sands and gravels of the Wormit Gap (Excursion 6). Cross the A914 at Links Wood Roundabout and continue on the unclassified road to a T-junction. At this junction turn right onto the B946 into Wormit. Two hundred metres northeast of Wormit post office, turn sharp left onto Bay Road leading to the shore and passing beneath the Tay Railway Bridge. Dismount at the bay, send the bus back to the bridge and proceed west along the shore for a little less than 1 km, past the small ruined fishing lodge to Peasehill Point [NO 383 258]. The section can now be examined by walking back along the shore to the east as far as a point 400 m ENE of the railway bridge. At Peasehill Point rather deeply weathered andesite lavas, of the Ochil Volcanic Formation, are exposed. They are grey and rotten at HWM, brown and fresher above this and cut by carbonate veins. Twenty-five metres east of the point the western margin of the Peasehill Point rhyolite is reached. The colour contrast between the grey andesite and the salmon pink rhyolite is pronounced. At the contact between the two is a thin (10 cm) sheared layer. Next to this highly crushed layer, the rhyolite is whitened for about 30 cm. The andesite is also altered, but in a much wider (5 m) zone. Eastwards along the foot of the cliff the rhyolite is usually thinly flow banded. Notice too an 8 cm thick red calcite vein 15 m east of the contact. The banding, which is most obvious in weathered material and is accentuated by joints, is initially parallel to the margin of the intrusion at its western end but, after a gap, strikes NW–SE and dips steeply to the north-east. After about 90 m the dip gradually changes through vertical until it dips to the SW at a point where the rhyolite abuts against a breccia which narrows into the cliff. The rhyolite varies in colour from pale grey through fawn to salmon pink. All varieties contain pale altered feldspar phenocrysts. At the contact between the rhyolite and the breccia, notice just below HWM a small area of muddy sediments. Up the shore from this, the rhyolite appears to intrude the breccia and to roof it over, though the contacts are much obscured by vegetation. Eastwards the breccia is followed briefly by further exposures of rhyolite and then a second breccia. The banding in this rhyolite is abruptly cut off by the breccia. This breccia contains not only rhyolite blocks, but also blocks of sandstone and shale, particularly on the eastern side. Two possible explanations for the rhyolite can be offered. Harry (1956, p. 55) suggested that the rhyolite represented a vent intrusion, the breccia largely preceding the rhyolite. Alternatively, Armstrong et al. (1985, p. 36) suggest that the rhyolite is in fact a lava (as suggested by Geikie 1902, pp. 36–7), which may have lain within a small vent and have been faulted down into its present position from a higher level. Eastwards from the rhyolite a series of sediments can next be examined. Fifteen metres of yellow-brown gritty sandstones with mud pellets and cross bedding dip south-east and pass beneath 1.8 m of dark grey, carbonaceous shales (exposed at the base of the cliff), which have yielded a considerable fish fauna: Brachyacanthus, Ischnacanthus and Mesacanthus, together with Kampecaris, Pterygotus and Parka, are recorded by Weston (1950, p. 8), but a prolonged search is usually necessary to find even traces of these. Armstrong et al. (1985, p. 100) have suggested that this fauna is not of great stratigraphical significance. A short distance west of the fishing lodge, a decomposed lava overlies the shales which have been squeezed up into the base of the flow. The flow has locally been converted to white trap at its base, through reaction with the carbonaceous sediment, and the shales have been baked at the contact. For the next 180 m there follow scattered small outcrops of flaggy and muddy sandstones, purple and grey in colour and occasionally coarse grained. This succession is about 60 m thick and the sandstones were at one time worked in an old quarry 180 m ESE of the fishing lodge, the remains of an old pier used for their export still being visible north of the quarry. In the quarry two small faults cut the sandstones, which are here tuffaceous. Near the top of the sandstones on the shore, small scale graded bedding can be seen just before they are succeeded by a thick sequence of lavas. Such sediments are typical of the Dundee Formation, lateral equivalent of the Ochil Volcanic Formation. Here the two are interbedded. The next 275 m of the shore section is composed of basic pyroxene-andesite lavas. These are rather deeply weathered and are greenish in colour on account of a high content of secondary chloritic minerals. Feldspar phenocrysts, though small, often demarcate flow lines in the rock. When fresh, such andesites contain pseudomorphs after olivine phenocrysts, plagioclase feldspar phenocrysts and rare augite phenocrysts all set in a groundmass of feldspar laths and tiny augites (Armstrong et al. 1985, p. 40). Red or purple staining is common and may be on the tops of some flows. Tops and bottoms of flows are not, however, conspicuous. The lavas are amygdaloidal, the amygdales being filled with chlorite, calcite, clear crystalline quartz or agate. At the footpath sign near the end of the concrete wall, the rocks at HVVM show sediments washed into cracks in the lava top and red lateritic weathering. The 0.5 km gap in exposures which forms Wormit Bay is due to an overdeepened channel excavated by a branch of the Carse of Gowrie Glacier which flowed through the Wormit Gap to the south-east (see Excursion 6). Beyond the bay a 3.5 m long erratic block lies on the first lava outcrop. It is composed of Dalradian schistose grit brought from the Highlands by the Carse of Gowrie ice during the last glacial advance, as was a partly buried large block of dioritic or granodioritic rock a few metres away. The lavas here are red or purple stained and are much altered andesites. They are highly amygdaloidal, chlorite being the commonest filling. Tops of flows can be seen from time to time picked out by lateritic weathering. As was the case further west, much sediment is trapped in the flows though there is little sediment between them. One hundred and forty metres north-east of the large erratic block, note the occurrence of 3.5 m of chocolate-red, muddy, feldspathic sandstones which interrupt the lava sequence and form a band across the shore. The base of the sandstones, when exposed, may be seen to rest on an uneven surface of lava. The base of the overlying lava can be seen to have a sharp contact with the sediment, but in places seems to have sunk into the sediment below producing an irregular contact. The base of the lava is rubbly and locally vesicular. Kokelaar (1982) has described very similar phenomena from the base and top of andesite sills within the Old Red Sandstone volcanics in Ayrshire. The succession of flows continues for a further 180 m to a point 75 m from the bridge, with only two 30 cm thick beds of red-brown micaceous mudstones to break the sequence. The rocks are similar to those described above. One of the flows, fresher than most, proved to be hypersthene-andesite when examined under the microscope. Seventy-five metres short of the bridge, a 1 m thick green sandstone rests on the slaggy top of a flow. It is succeeded by a thick basic-lava volcanic conglomerate which extends to the remains of a pier built on a rocky point 75 m beyond the Tay Bridge. The conglomerate comprises rounded blocks of andesite, often amygdaloidal and not infrequently containing feldspar phenocrysts up to 1 cm long. Individual blocks average about 15 cm in length with a maximum of about 30 cm. The matrix is composed of fine lava debris and scattered through the conglomerate are impersistent lenses of cross-bedded sandstone or grit. Jointing in the rock cuts both pebbles and matrix, and calcite veins are common. Exposures, though continuous in the cliff, are best examined on the wave-washed surface at the pier mentioned above. Six metres of tuffaceous sandstone or tuff, containing larger rock fragments towards the top, overlie the conglomerate at the ruined boathouse and remains of a jetty. Beyond this boathouse to the east are two thin autobrecciated lava flows which have a great deal of green sandstone mixed through them; so much, in fact, that it is difficult to recognise the rock as a lava at all. A little further to the east this is followed by volcanic conglomerate with both angular and rounded blocks of lava in a tuffaceous matrix. This is a rock in marked contrast to the volcanic conglomerate at the old pier where the blocks are well rounded. This conglomerate does not appear to be the product of a single eruptive episode however, for a 1 m thick tuff or tuffaceous sandstone interrupts the conglomerate at one point and, beyond an iron pipe which crosses the shore, the fragments are very well rounded, a feature suggesting reworking of the material. A further pause in accumulation is indicated by a 2 m thick band of lateritic tuff a few metres below the top of the conglomerate, 40 m east of the pipe. The top of the conglomerate is marked by a lm thick bed of green volcanic-detrital sandstone which crops out in the cliff opposite the wreck of a ship about 12 m long, lying in the river mud and forming an obvious landmark except at high tide. This sandstone is overlain by further conglomerate and breccia with sharp angular blocks of andesite and rhyolite about 5 cm in diameter in a reddish-brown matrix. The junction with the underlying sandstone is quite sharp. Upwards the blocks in the breccia increase in size up to about 45 cm in diameter and rarely to 2 m. In this rock have been found signs of plastic deformation of the fragments and some alignment of the smaller clasts. Recently such rocks have been interpreted as debris flow deposits, e.g. Armstrong et al. (1985, p.38). Blocks in this rock yielded the rhyodacite glass studied by Judd (1886). It is followed sharply upwards by a 4.5 m thick lava flow containing amygdales filled with agate. Beyond this and still dipping south-east at 20°, volcanic conglomerates and tuffs, containing rhyolite fragments and blocks up to 2 m across, continue for another 275 m.
Return to the bus by retracing your steps westwards as far as the lifeboat house where a path ascends to the road, and return to St Andrews by retracing the outward route. ARMSTRONG, M., PATERSON, I. B. and BROWNE, M. A. E., 1985. Geology of the Perth and Dundee districts. Mem. Br. Geol. Surv. Sheets 48W, 48E, 49. GEIKIE, A., 1902. 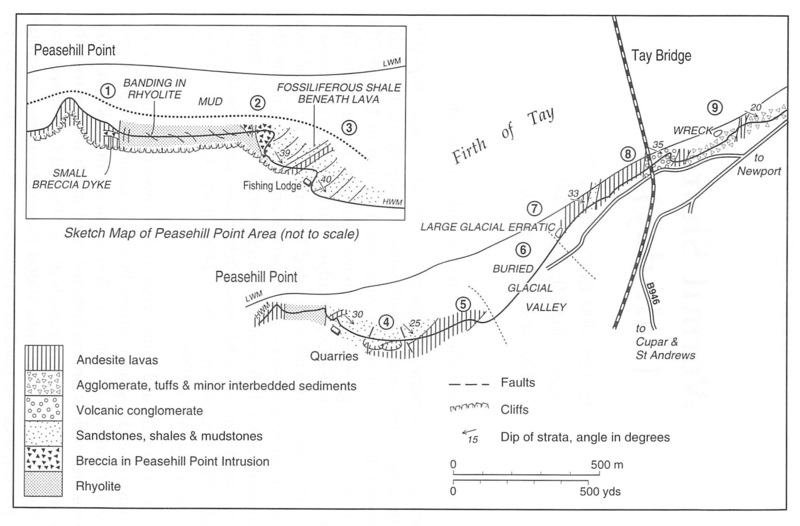 The Geology of Eastern Fife. Mem. Geol. Surv. Scotland. HARRY, W. T., 1956. The Old Red Sandstone Lavas of the Western Sidlaw Hills. Geol. Mag. 93, 43–56. JUDD, J. W., 1886. Appendix to Durham, J., Volcanic rocks of the northeast of Fife. Quart. Jour. Geol. Soc. Lond. 42, 418. KOKELAAR, B. P., 1982. Fluidization of wet sediments during the emplacement and cooling of various igneous bodies. Jour. Geol. Soc. Lond. 139, 21–33. WESTOLL, T. S., 1950. The vertebrate-bearing strata of Scotland. Rep. XVIIIth Int. Geol. Cong. Part II, 5–21. This page was last modified on 23 February 2019, at 09:43.